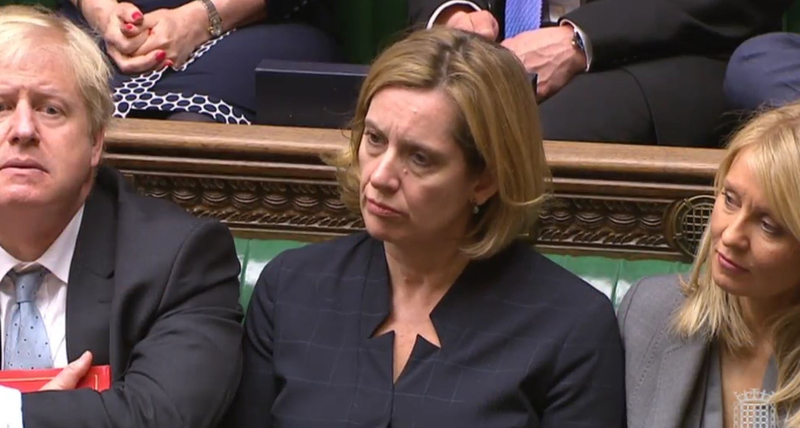 PRESSURE is mounting on Home Secretary Amber Rudd after she admitted she should have known about official targets for removing illegal immigrants. The minister faced fresh calls to resign yesterday after an internal Home Office memo was leaked suggesting she was informed of the targets – even though she previously told MPs she was unaware of them. But Joanna Cherry QC, SNP justice and home affairs spokeswoman, said: “If this secret memo is accurate then it suggests the Home Secretary is either utterly incompetent, or she knowingly lied to Parliament – either way Amber Rudd must go.” Ms Rudd has been under fire over the handling of the Windrush immigration scandal. According to the Home Office memo, there was “a target of achieving 12,800 enforced returns in 2017-18”. Ms Rudd is due to give a statement in the House of Commons tomorrow and has been summoned back to give evidence to the Commons home affairs committee. Downing Street said Ms Rudd had the “full confidence” of the Prime Minister. Meanwhile, MPs are calling on the UK Government to urgently compensate members of the Windrush generation forced to spend thousands of pounds to prove they have the right to stay in the UK. The Home Office has announced a compensation scheme will be set up, but no details have been provided.